I have now decided NEVER to cash out on golf betting. I did it at the Masters and Jordan Speith went on to win costing me a few quid. Last Sunday I didn’t and Rickie Fowler did the business – ensuring that my Paddy Power account is looking very healthy. No sign of any movement on the Dacia Duster. At what point do Trading Standards get involved? It was a cold weekend for cricket, but fortunately good sense prevailed at High Lane and they rang to call the game off in the morning, saving us a wasted journey. Sunday morning saw the Under 11 suffer a heavy defeat, but they all seemed to enjoy it which is why they do it! Last night I cycled to the cricket ground at Buxworth. I fully admit that I can’t get all the way up Silk Hill, it is too steep, and I was walking when Gibbo and Luke Dogg passed me near the top. Now, I don’t mind Luke passing comment on that, but for Gibbo to comment on it, that’s like Ed Milliband telling Nick Clegg he didn’t get enough votes. Time to resurrect Gibson’s Facebook challenge! Ole is now into high protein food, so he wants fish for tea. That won’t last long, especially when Sally has to prepare it for him. Meanwhile, Sally has gone overboard on crumble, so a huge rhubarb and apple one was cooked on Saturday, and demolished by Sunday evening. Zac is about to go on a school trip for 3 days where he says he is going to try new foods. I guess this means just different slices of bread, but we will see! He is still in single figures when it comes to eating grapes and peas, and sweet potato came out of his mouth a lot quicker than it went in. He will eat approximately a quarter of a square inch piece of cabbage. Meanwhile, the cold war between Bobby and Sapphire appears to have disappeared completely. 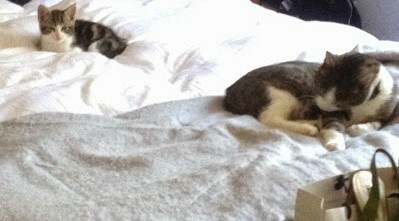 They now share a bed, albeit at a respectable distance from each other. Thursday has been earmarked as the day when Sapphire visits the vet, and you know what that means! And speaking of beds, Sapphire has now found a very snuggly spot to spend the night, between myself and Sally. The first night I got up at 2am and took the kitten downstairs for its food. It was back within minutes, and stayed fairly calm until 6.30am when it wanted to play. The same thing happened last night, but playtime was 5am. Its like having a baby all over again – but tonight it is going to get a shock locked out in the cold!